Like the best comic book superheroes, this dress has an almost unbelievable origin story. As you know, I've been sick with multiple viral infections for months, and have been pretty down about it all. Well, I stepped out of the flat one day a few weeks ago and bam! right on the pavement outside the flat was a Tilly & the Buttons Bettine dress pattern, just lying there! I mean, seriously, what are the chances? I could've just left it there for whomever dropped it to recover, but with rain forecast later in the day I didn't want it to get ruined and besides, this was the Universe giving me A Sign, and I didn't feel like I should overlook the only good luck I'd had in months! So I took it home and started fabric shopping immediately. Like the best comic book superheroes, this dress has an almost unbelievable origin story. As you know, I’ve been sick with multiple viral infections for months, and have been pretty down about it all. Well, I stepped out of the flat one day a few weeks ago and bam! right on the pavement outside the flat was a Tilly & the Buttons Bettine dress pattern, just lying there! I mean, seriously, what are the chances? I could’ve just left it there for whomever dropped it to recover, but with rain forecast later in the day I didn’t want it to get ruined and besides, this was the Universe giving me A Sign, and I didn’t feel like I should overlook the only good luck I’d had in months! So I took it home and started fabric shopping immediately. 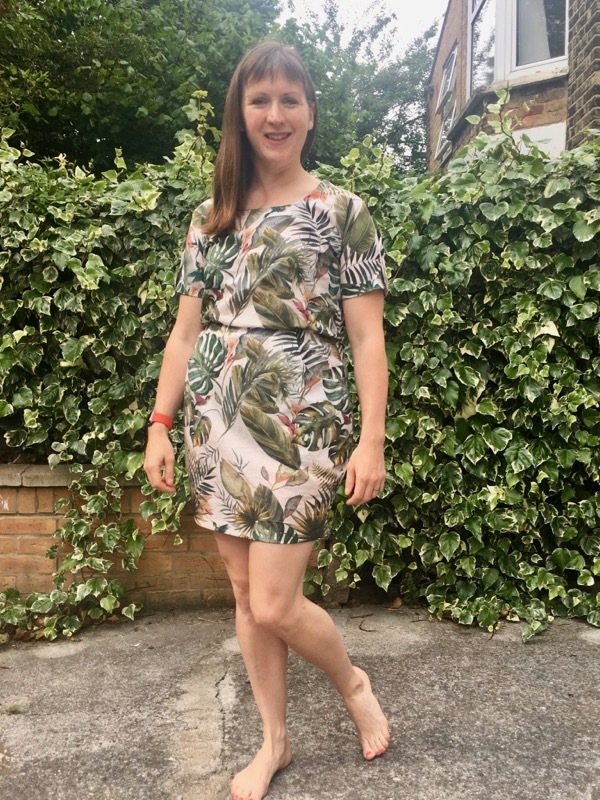 Sew Essential has recently grammed about some tropical print cotton lawn they’d taken shipment of, so I bought some of the light colourway to make a fun little summer day dress for myself. I was a little concerned I might need to underline it but it turns out it’s not sheer in the slightest so I kept it lightweight. I believe this might actually be my first time making a Tilly pattern, which is kinda shocking considering that I’ve known her for over ten years and have a few projects from her latest Stretch book earmarked to sew! 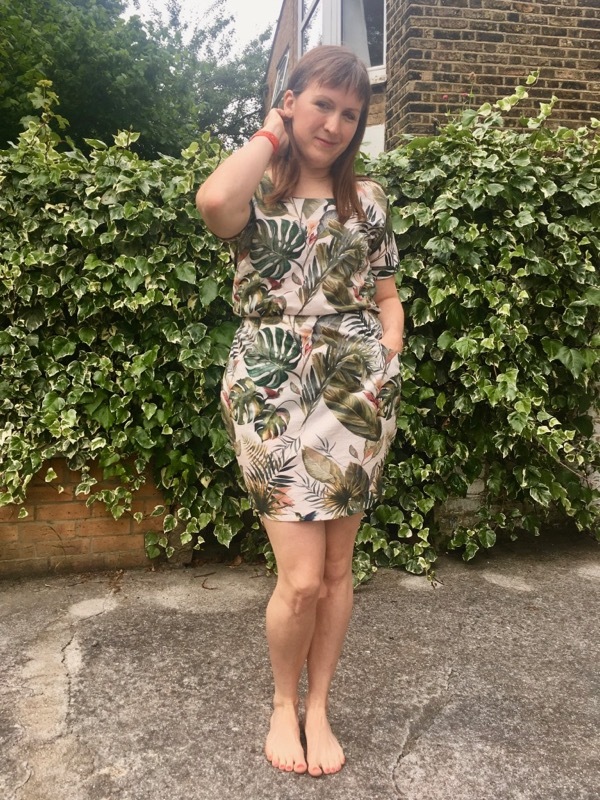 I cut a straight size 6 based on my usual measurements, because even though I’ve gained like 10kg while I’ve been sick, there seemed to be plenty of wearing ease and I didn’t want it to be overly baggy when I return to my usual dimensions. 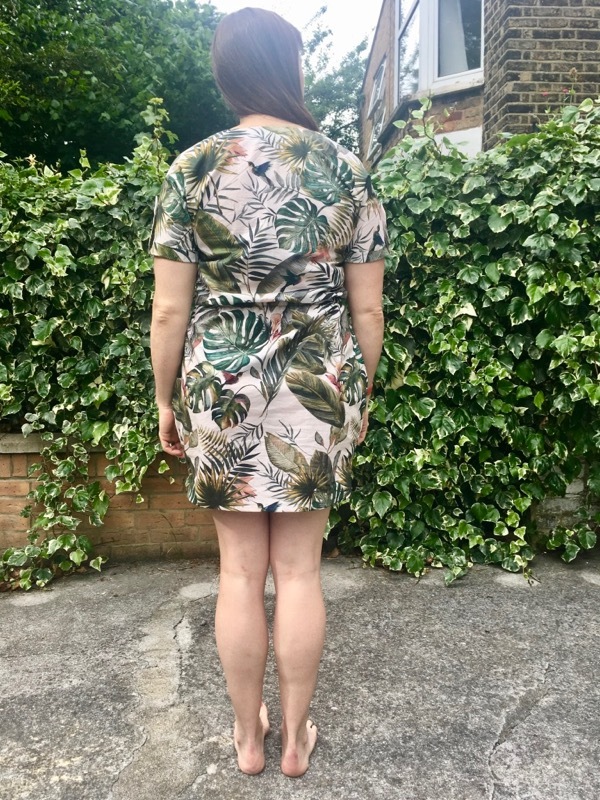 As it’s a beginner pattern, this was a really quick and fun one to sew together! It’s not got any darts, zippers, or buttonholes to sew, and the shaping is provided through an elastic casing in the waist seam. I’m never a big fan of casings tbh, but the method for creating this one is a lot more robust than most and it means I can also take in the elastic in a few months if I need to. It’s got nice big pockets in the skirt, too, and even though it’s a beginner pattern, those pocket linings are understitched so you get a nice finish on it without the lining peeking out. 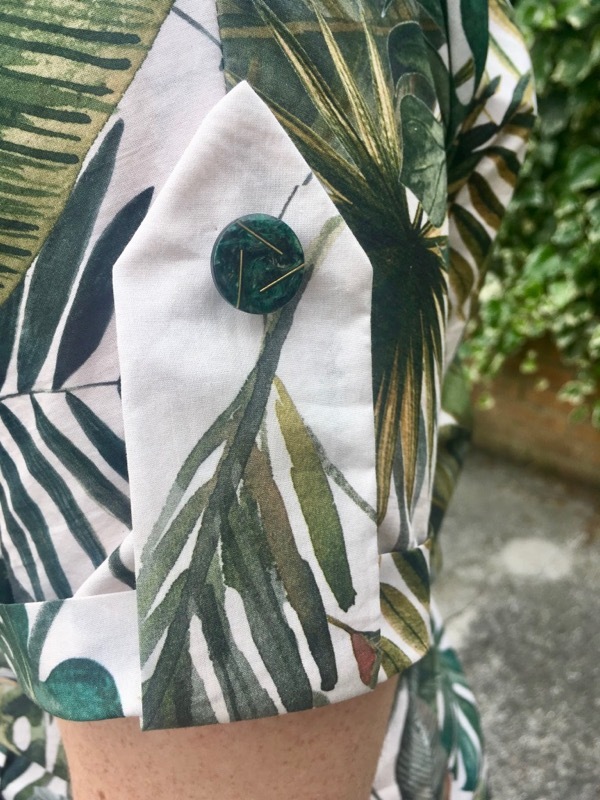 I went for the view with the additional buttoned sleeve tabs, and I had a hunt in my button stash and found the most perfect swirly green buttons with thin lines of gold! I have no idea where these came from, or how there came to be exactly the two I needed in my stash, but again, the Universe had a hand in this I suppose! It’s a personal preference, but I feel that the cuff size and button tab are a bit out of proportion to my eye. If I’d make this again, I’d sew the button tab intended for the smaller size range and make the cuff itself about twice as wide. As it is here, the tab feels huge and the cuff too small, but that’s really only a minor design complaint. And there you have it – a pattern fell from the sky and who was I to argue? 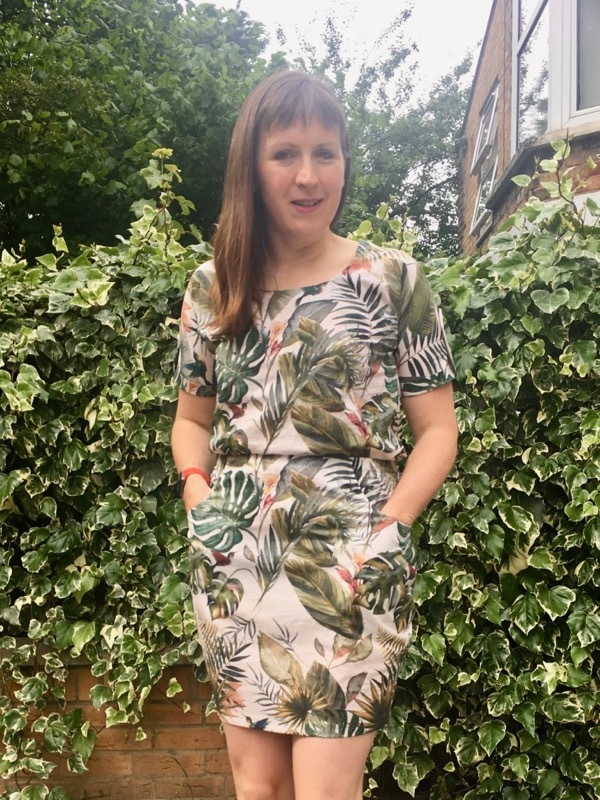 Now I have a great summer dress in my wardrobe and a nice little pick-me-up when I really needed it. Has anyone else ever had a pattern fall in their lap like this? Separator image Posted in Gallery and tagged with cotton, dress, tilly-and-the-buttons. 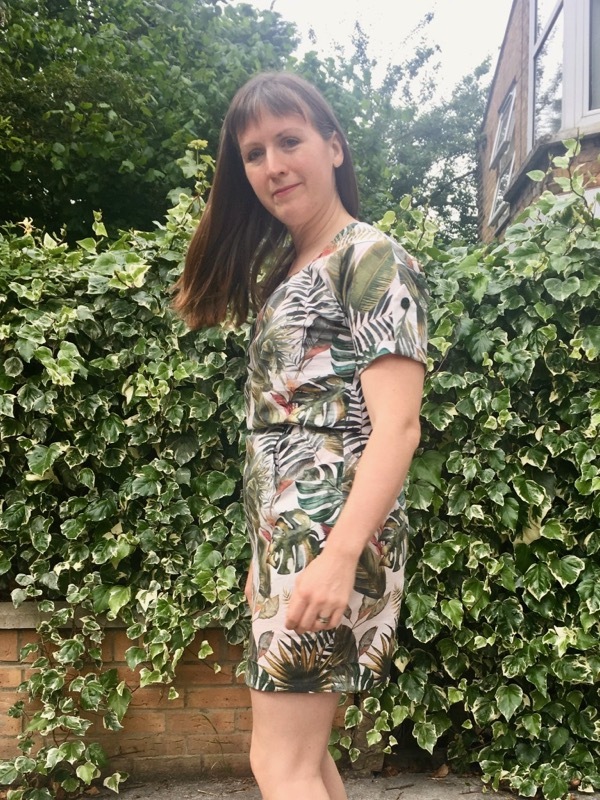 Love your tropical print dress. Most appropriate for the heatwave we have been having! Your make has inspired me to put this back in my sewing que. Your comments regarding the fit are most helpful to me as I am also “shortwaisted”. Wishing you brighter days ahead. What a great score–a free pattern! You look fabulous in that dress. I sincerely hope that you are feeling better soon. Had a quick check – nothing on the doorstep. 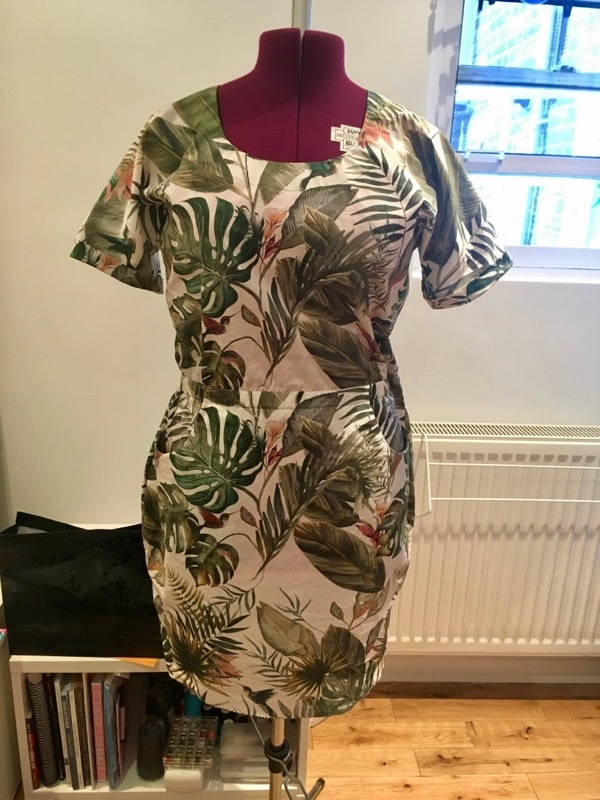 I really hope the person who was sad to lose their pattern reads this and is left feeling happy at the positive effect the gift has had on you, and at the gorgeous dress you created! What a great story! Your dress looks great and I am glad this has brought a little cheer in your life. 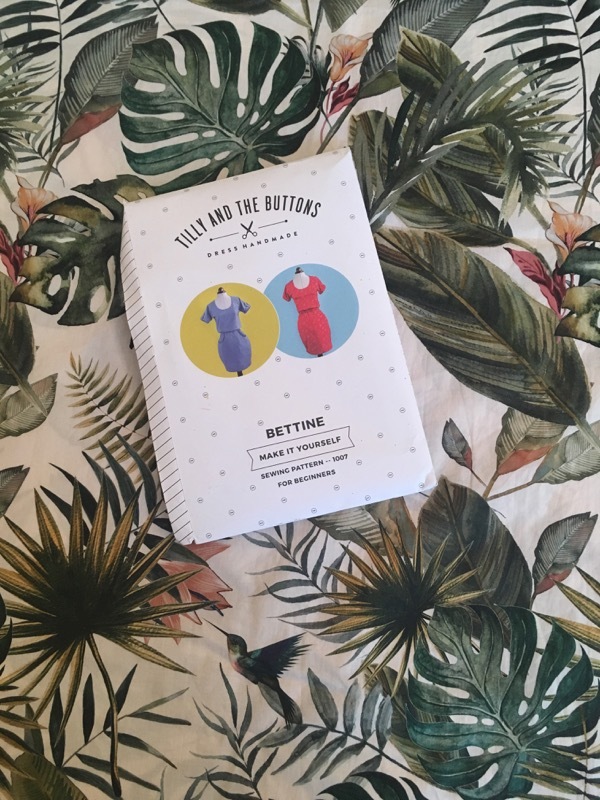 I want to make a summery dress & I think I will add Bettine to my list of possibilities. I agree with you on the dimensions of the cuff & tab…I think the cuff needs a little more width. Hope that you will be feeling better soon. Considering how ill you’ve been you look great. The dress is lovely on you. You’ve moved from your boat?